remains at 5 (of 6) and the more sensitive GMI-R is at 8 (of 10). The QQQQ and SPY ETF’s have closed above their 10 week averages for 11 weeks. The Worden T2108 indicator is at 76%, out of extreme overbought readings. 39% of the NASDAQ 100 stocks closed with their MACD above their signal lines…. There are a number of rocket stocks near all-time highs worth monitoring: HOGS, ARST, SCL, MVL, CERN, SYNT, ATNI, ARO, NEU, PCLN, MHS, BWY, TDC, SNX, IPCM, LL, DISCA, NETL, WMS, SWM, FIRE, EMS, SXCI, NTES,GYMB, PEGA, ROST, LZ. 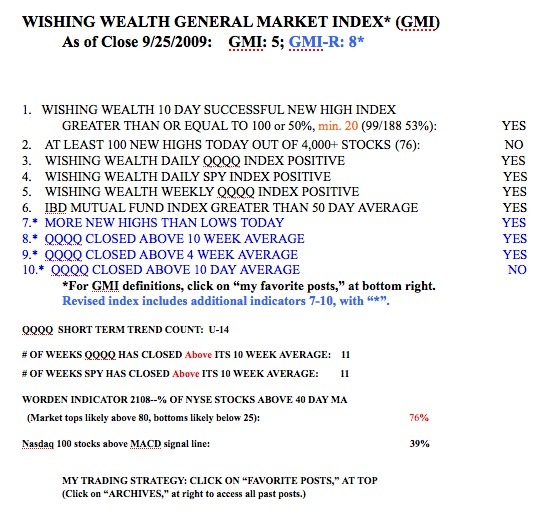 Another prescient post… thanks for sharing your indicators. TYH hit $126 today and looks to be bouncing up a little after hours past $128. At what price point will you be buying TYH again?